Back in April, I told you about the massive tadpole die-out that happened in our driveway after the flood. About now I bet there would be thousands of frogs hopping around in our lawn. Since the flood, we decided to have the driveway dealt with. The pipe at the end of the driveway that serves as the culvert is falling apart. The rain washed out the driveway to the point were I feel like I am driving over speedbumps every time I go anywhere, and I am tired of walking in pudding-like mud every time it rains. It's a good thing we're having the driveway paved. 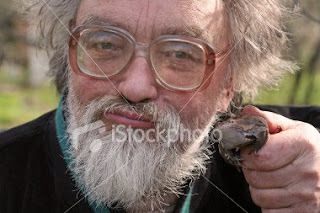 If the frog infestation continued, this is what you'd look like when you're old.